NOTE: The following is a very manual process, we have since released Multisite Tools 1.1 which includes Pull a Single Site Install into a Subsite functionality. Follow the steps below to convert a standalone WordPress site into a WordPress Multisite subsite. 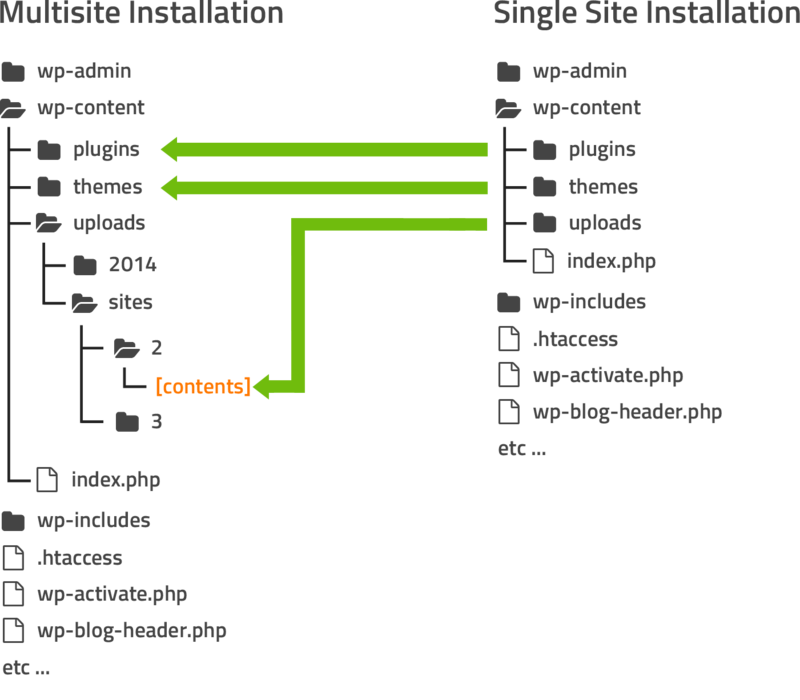 To import a single site install of WordPress as a subsite of a multisite install you’ll first need to create the subsite on the multisite. Click the “Sites” menu item, here you’ll be presented with a list of your subsites. Click the subsite you wish to extract. Navigate to the WP Migrate DB Pro admin page, i.e. Settings → Migrate DB Pro. Ensure “Export File” is selected. In the Find & Replace section copy the contents of the URL find column into the URL replace column (click the right arrow). Update the URL replace column to match the subsite’s address (“//blog.example.com” in our example). Fill in the file path Find & Replace row as required (or remove it if not required). Later we’ll be copying across your uploads directory (see Copying Themes / Plugins / Uploads below) so you may want to add another Find & Replace row to convert the subsite specific uploads paths, for example: “/uploads/” => “/uploads/sites/2/”. Click the “Migrate” button, wait for the export to complete. Open the SQL file in your text editor of choice. Find and replace all instances of the single site table prefix with your new subsite table prefix, e.g. “wp_” → “wp_2_”. Tip: table and index names should be surrounded with ` (back ticks), this means searching for `wp_ and replacing with `wp_2_ will get you far. Tip: Most other required replacements should be in the “meta_key” and “option_name” fields of the “usermeta” and “options” tables respectively and can be found with 'wp_. Save and close the SQL file. Import the SQL file into your multisite’s database. At this point all the database tables from the single site install of WordPress have been imported into the multisite with their proper subsite prefix. However, both the “users” and “usermeta” tables were imported with the new prefix too, but in a multisite install the users and usermeta tables are global and hold information about all the users across all the subsites. This means you need to carefully merge the users and their meta data from the wp_2_ prefixed tables into the wp_users and wp_usermeta tables. You then need to update all their posts, comments and other data to have the correct user_id. -- To enable matching of old and new user ids. As well as updating posts and comments in the new subsite with the changed user ids, if you have any other tables that hold user authored data (such as the old links table) you should update them too. Once you’re happy that everything is updated and working as intended, you can delete the used wp_2_users and wp_2_usermeta tables from your multisite database. This isn’t a perfect method of importing users as you may end up with duplicate users if your users have created accounts on both the single site install or any of the sites hosted in the multisite network. You could conceivably run something similar to the above SQL to merge and delete duplicate users. See the diagram below illustrating which files to copy from your existing single site installation to your multisite installation. You have now successfully imported a single site install of WordPress as a multisite subsite.